Matt is El Patrón’s clone, and is seen as nothing but an organ donor by everyone around him, minus Celia, Tam Lin, and María. He grows up being told that he’s less than human. El Patrón becomes sick, and tries to take Matt’s heart, but Celia had been poisoning Matt with arsenic, so his heart is useless and would kill El Patrón anyway. Matt escapes into Aztlán, and is found by the Keepers. There, he makes some friends, is almost killed, but once again he escapes. He reunites with María at the convent, and then flies back to Opium to take the country back. Celia, Daft Donald, and Mr Ortega are all there. Tam Lin and the rest all died with El Patrón. Matt is now in control of Opium. The book begins with a scientist implanting cells into cows in order to grow clones for El Patrón. Only one survives. Matt lives with Celia. Not allowed to leave cabin. One day, children turn up outside. They try to get Matt to speak, but he is trapped inside. They return another day with María in tow. Matt breaks the window, asks them to play, and jumps out onto the glass. The children, Steven and Emilia, carry Matt to the main house because he’s bleeding. Rosa starts to treat Matt until she realises he is a clone. A doctor is called. No one sends Matt back to Celia, instead Rosa keeps him in a small room and lays sawdust on the floor. María visits from time to time, and the two become friends. Tom also visits, and starts shooting Matt with peas. Matt overhears Rosa and the doctor, Willum, arguing and flirting. Both at the same time. El Patrón learns of Matt’s situation through Celia, who found out through María. He orders that the people of his house treat Matt with respect. Matt goes to live in Celia’s apartment, and Tam Lin is appointed to be his bodyguard. Matt, who hadn’t spoken since he was trapped by Rosa, finally starts speaking again after an eejit teacher annoys him. Tam Lin shows Matt an oasis in the desert to celebrate. María loses her dog, Furball, and Matt helps her look for him. He finds Furball in the toilet, shivering and almost drowned. Matt suspects that Tom put Furball in the toilet, although he has no way of proving it. El Patrón has a birthday party at the mansion, and it’s all very over the top. A bunch of important people and celebrities come to wish El Patrón well. Matt makes Tom sit at the babies’ table as payback for being a prat. Felicia, Tom’s mother, is annoyed by this. El Patrón finds it amusing. Matt makes María give him a birthday kiss, and María gets very upset. She refuses to speak to Matt. Tom takes María and Matt to the hospital, and shows them a clone who is being experimented on. Matt tries to get María to speak with him, but she refuses. He kidnaps her dog, Furball, and leaves a note telling her that she will never see Furball again if she doesn’t meet Matt. Matt plans to drug Furball with opium, but doesn’t go through with it. He hides Furball instead. Someone kills Furball, and Matt gets the blame due to the note. María is shipped off to a convent with her sister, Emilia. Tam Lin goes away with El Patrón. Matt discovers a chest, supplies, a book, and a note from Tam Lin at the oasis. Tam Lin says that he had no choice but to leave. The book is about the history of Opium, and El Patrón. It was written by María’s mother, who, up until now, was presumed dead. She’s been living in the United States and is fighting against Opium and the slavery they have going on there. El Viejo, Steven’s grandfather and El Patrón’s grandson, dies and they hold a funeral funeral. María is there, and she forgives Matt. They find out that Felicia was the one to kill Furball, not Matt. El Patrón has a heart attack, and his mind goes. Matt overhears Tam Lin and Celia speaking, and asks questions about how he was made, born, and how old he is. They tell him he’s fourteen. Steven and Emilia get married. Or, rather, they try to get married but El Patrón collapses during the ceremony and everything falls into chaos. Knowing that something bad is about to happen to Matt, he and María attempt to escape. They make it as far as the hovercraft before Steven and Emilia find them and give Matt in. Matt tells María about her mother being alive, which is something that Emilia already knew. Matt is taken to the hospital so that they can take his heart and give it to El Patrón. He’s now nothing more than an organ donor. Celia reveals that she had been feeding Matt arsenic. Not enough to kill him, but enough to poison his heart so that El Patrón can’t have it. El Patrón’s heart can’t take the stress and he dies. Tam Lin gets Matt out of the hospital and into the mountains. He tells Matt to escape into Aztlán and to find María at her convent. Matt makes it to Aztlán, but is almost caught by Farm Patrol, who take his rucksack full of supplies and money. Matt escapes them, and runs into the Keepers. The Keepers take Matt home with them and put him in a dorm with a bunch of other boys. The Keepers keep the boys there and make them work to run their farm. The Keepers preach about everyone being equal, but it’s clear that the Keepers are far better off than the boys. Matt refers to Celia and Tam Lin as his parents for the first time, and I cry. Matt clashes with the Keepers, because he doesn’t agree with the way they do things. He is beaten, and then he and Chacho, a fellow teenager, are thrown into a pit of bones. They have to climb out, and at one point it looks as though Chacho dies, but it’s okay, he’s just injured. Ton-Ton helps save them, he helps the boys lock the Keepers up in their building. Chacho is taken to hospital. Matt comes across two people called Consuela and Guapo. They take him to the convent, and when they arrive they find the Keepers surrounding Chacho, who is still unconscious. The nuns are trying to protect him. There’s a small fight, which is interrupted by María’s mother, Esperanza. She tells Matt that they have arrested and shut down the Keepers, who were keeping a warehouse full of drugs. María and Matt are reunited, but Matt has to leave for Opium to see why the country is in lockdown. It has been that way since Matt escaped and El Patrón died. Matt arrives in Opium and is reunited with Celia, Daft Donald, and Mr Ortega. They tell him that during El Patrón’s wake, an ancient glass of wine was opened for everyone to drink. Tam Lin warned Daft Donald against drinking the wine. Everyone who did drink it died, because El Patrón wanted to take his giant empire with him to the afterlife. Tam Lin drank the wine because of the horrible things he did when he was younger, such as killing a school bus full of children. Matt is very overwhelmed, but after a short walk around the farm, he has a think about all the things he has to do to make Opium better, and how to save people’s lives. Opium – The country between Aztlán and the United States, which El Patrón rules. It’s basically a giant drug empire. Aztlán – Where El Patrón grew up. Used to be called Mexico. Eejit – A slave who has a computer chip in their brain to make them docile. They don’t have a mind of their own, and always follow orders to the death. Keepers – People in Aztlán who recruit young teenagers to do their work while they smuggle drugs into Aztlán. Farm Patrol – The police force of Opium, who make sure no immigrants get through, and nobody escapes. !!! I looooved that book as a kid, I look forward to the second one. So glad this went up, I need to refresh my mind. 🙂 Good job, Amber! This is a really great post! 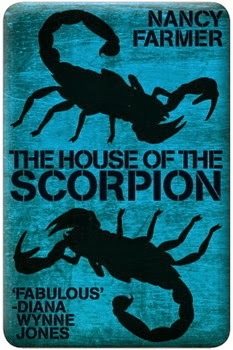 If you want to check out more about the house of the scorpion, look at our blog, and feel free to leave a comment!! (: http://thescorpionhousegdpam.blogspot.ca Thank you !